Not to be confused with Elisha Cooke Jr..
Elisha Vanslyck Cook Jr. (December 26, 1903 – May 18, 1995) was an American stage, film and television character actor who often specialized in roles as "cowardly villains and neurotics." He is perhaps best remembered for his portrayal of Wilmer in the 1941 version of The Maltese Falcon and the futile efforts made by his character to intimidate Sam Spade (Humphrey Bogart) in the film. Cook's acting career spanned more than 60 years, with roles in productions such as The Big Sleep, Shane, The Killing, House on Haunted Hill, and Rosemary's Baby. 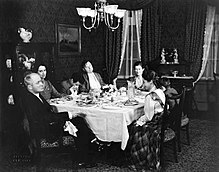 Around the table in the Theatre Guild's original 1933 Broadway production of Ah, Wilderness! are (from left) George M. Cohan, Eda Heinemann, Elisha Cook, Jr., Gene Lockhart, Marjorie Marquis, Walter Vonnegut, Jr. and Adelaide Bean. Cook was born in 1903 in San Francisco, California, the son of Elisha Vanslyck Cook Sr., a pharmacist, and grew up in Chicago. He first worked in theater lobbies selling programs, but by the age of 14 he was already performing in vaudeville and stock. As a young man, he traveled and honed his acting skills on stages along the East Coast and in the Midwest before arriving in New York City, where in 1926 he debuted on Broadway in Hello, Lola. Some other Broadway productions in which Cook performed were Henry-Behave (1926), Kingdom of God (1928), Her Unborn Child (1928), Many a Slip (1930), Privilege Car (1931), Lost Boy (1932), Merry-Go-Round (1932), and Chrysalis (1932). Then, in 1933, Eugene O'Neill cast him in the role of Richard Miller in his play Ah, Wilderness, which ran on Broadway for two years. Cook continued to appear on stage during the remainder the 1930s; and although his acting career after that focused increasingly on films and then on television roles, he periodically returned to Broadway, where as late as 1963 he performed as Giuseppe Givola in Bertolt Brecht's play The Resistible Rise of Arturo Ui. With regard to Cook's military service during World War II, he enlisted at the age of 38 in the United States Army on August 15, 1942, in Los Angeles, California. According to his enlistment record he stood 5-feet-5-inches tall and weighed 123 pounds. Cook's military record also documents that his highest level of education by that time was his completion of "3 years of high school". Many online references, however, state that he had attended "St. Albans College", "The Chicago Academy of Dramatic Art", and "The Chicago Academy of Fine Arts", which, it should be noted, had been renamed the Art Institute of Chicago in 1882. Those same references, though, do not provide any dates when Cook reportedly took classes at or graduated from those cited institutions. In 1930, Cook traveled to California, where he made his film debut in Hollywood's version of the play Her Unborn Child, a motion picture directed by Albert Ray and produced by Windsor Picture Plays Inc. After several subsequent small roles and uncredited parts in other films, he began a long period playing weaklings or sadistic losers and hoodlums, who in the plots were usually murdered, either being strangled, poisoned or shot. Hollywood's most established fall guy for many years, he made a rare appearance in a cameo role in the 1941 slapstick comedy Hellzapoppin', performing as a screenwriter. In Universal's Phantom Lady (1944), he portrays a slimy, intoxicated nightclub-orchestra drummer to memorable effect. He also had a substantial, though uncredited role as Bobo in the 1953 film noir production I, the Jury. In addition to his performance as Wilmer in The Maltese Falcon (1941), some of Cook's other notable roles include the doomed informant Harry Jones in The Big Sleep (1946), the henchman (Marty Waterman) of the murderous title character in Born to Kill (1947), the pugnacious ex-Confederate soldier 'Stonewall' Torrey who is gunned down by Jack Palance in Shane (1953), and George Peatty, the shady, cuckolded husband in Stanley Kubrick's The Killing (1956). Other films in which he appeared are William Castle's horror film House on Haunted Hill (1959), One-Eyed Jacks (1961), Papa's Delicate Condition (1963), Blood on the Arrow (1964), Rosemary's Baby (1968), The Great Bank Robbery (1969), El Condor (1970), The Great Northfield Minnesota Raid (1972), Pat Garrett and Billy the Kid (1973), The Outfit (1973), Tom Horn (1980), and Treasure: In Search of the Golden Horse (1984). Cook appeared on a wide variety of American television series from the early 1950s to the late 1980s. He played a private detective, Homer Garrity, in an episode of Adventures of Superman television series titled "Semi-Private Eye," airing for the first time on January 16, 1954. That same year, on April 12, he guest-starred on NBC's The Dennis Day Show. In 1960, he was cast in the episode "The Hermit" of the ABC sitcom The Real McCoys with Walter Brennan. He appeared too in 1960 as Jeremy Hake in the episode "The Bequest" of the ABC western series The Rebel, which starred Nick Adams. He also portrayed the character Gideon McCoy in the 1966 episode "The Night of the Bars of Hell" on The Wild Wild West. He performed as well in the second episode of ABC's crime drama The Fugitive. Cook made two guest appearances on the CBS courtroom drama series Perry Mason. In 1958, he played Art Crowley in "The Case of the Pint-Sized Client", and in 1964 he played Reelin' Peter Rockwell in "The Case of the Reckless Rockhound". Cook portrayed lawyer Samuel T. Cogley in the Star Trek 1967 episode "Court Martial", Isaac Isaacson on the Batman television series, Weasel Craig in Salem's Lot, and later had a long-term recurring role as Honolulu crime lord "Ice Pick" on CBS's Magnum, P.I. He appeared too in The Bionic Woman episode "Once a Thief" in 1977. [Cook] lived alone up in the High Sierra, tied flies and caught golden trout between films. When he was wanted in Hollywood, they sent word up to his mountain cabin by courier. He would come down, do a picture, and then withdraw again to his retreat. Cook died of a stroke at age 91, on May 18, 1995, at a nursing home in Big Pine, California. He was the last surviving member of the main cast of The Maltese Falcon. ^ a b "Elisha Cook, Jr. Biography", Turner Classic Movies (TCM), Turner Broadcasting System, a subsidiary of Time Warner, Inc., New York City, New York. Retrieved July 30, 2017. ^ a b c d Thomas Jr., Robert McG. (May 21, 1995). "Elisha Cook Jr., Villain in Many Films, Dies at 91". The New York Times. 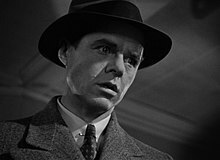 Elisha Cook Jr., whose intense, bug-eyed portrayal of Wilmer, the psychotic, baby-faced killer in The Maltese Falcon, made him a cult figure to a generation of moviegoers, died on Thursday at a nursing home in Big Pine, California. He was 91. He was the last surviving cast member of John Huston's 1941 film noir classic, whose company included Humphrey Bogart, Sydney Greenstreet, Peter Lorre and Mary Astor. ^ Folkart, Burt A. (1995). "Elisha Cook Jr., 91; Classic Movie Villain", Los Angeles Times, May 20, 1995. Retrieved July 31, 2017. ^ a b c "Elisha Cook Jr.: Other Works" Internet Movie Database (IMDb), a subsidiary of Amazon, Seattle Washington. Retrieved July 31, 2017. ^ a b c "United States World War II Army Enlistment Records, 1938-1946: Cook Jr, Elisha V., enlistment date 15 August 1942, Los Angeles, California, United States; merged database with "Electronic Army Serial Number Merged File, ca. 1938-1946", Access to Archival Databases (AAD), National Archives and Records Administration (2002), National Archives, College Park, Maryland. Transcription of noted enlistment record available at FamilySearch, a free online genealogical database provided as a public service by The Church of Jesus Christ of Latter-day Saints, Salt Lake City, Utah. Retrieved July 30, 2017. ^ Notable Names Database NNDB, Soylent Communications, Mountain View, California, 2016. Retrieved July 30, 2017. ^ "Her Unborn Child (1930)", Turner Classic Movies (TCM), Turner Broadcasting System, a subsidiary of Time Warner, Inc., New York City, New York. Retrieved July 31, 2017. ^ "California Divorce Index, 1966-1984", divorce of Elvira A. McKenna and Elisha V. Cook, February, 1968, Inyo County, California. California Department of Health Services, Sacramento, CA. Transcribed document available on FamilySearch, a free online genealogical database provided as a free public service by The Church of Jesus Christ of Latter-day Saints, Salt Lake City, Utah. Retrieved July 30, 2017. ^ Huston, John (1994). An Open Book. Da Capo Press. p. 79. ISBN 978-0-306-80573-8. ^ "The Equalizer on The Life and Legend of Wyatt Earp". Internet Movie Database. April 16, 1957. Retrieved April 16, 2014. Wikimedia Commons has media related to Elisha Cook, Jr..